Can Portland Fix a Building That Pretty Much Everyone Despises? It's basically a Portlandia sketch: What if a city held a rally to save a building in trouble and no one came? As part of our series Preservation Battle, we look at significant structures at a crossroads, and today we're examining Portland, Oregon's very-endangered—yet almost-universally-hated—Portland Building. Designed in 1982 by Target teapot-designing architect Michael Graves, the building is one of the first-ever postmodern structures, created as a playful response to stark, cold modernism. It was built for only $25 million, a cost that was, as Graves once absurdly bragged in an interview, "lower than a spec house would be built for in the suburbs." Turns out the building was constructed so affordably that it's falling apart: A renovation will cost $95 million to fix water damage and structural problems. It's basically a white elephant. With green bows on it. The city might be able to overlook all that and pony up the cash if it wasn't for one simple fact: It is not a beloved building. Many Portlanders would sooner say good riddance to Graves's PoMo cube. What's a preservationist to do? Portland-based architecture journalist Brian Libby faces off against Gizmodo urbanism editor Alissa Walker to decide the fate of Portland's most misunderstood piece of architecture. When it comes to trophy buildings by internationally renowned architects, Portland usually pales in comparison to its larger west-coast neighbors, Seattle and San Francisco. And that has been a point of pride. In those larger cities north and south of Oregon, recent decades have brought eye-catching buildings by Pritzker Prize-winning starchitects like Frank Gehry, Rem Koolhaas, Snohetta, Stephen Holl, and Herzog & DeMeuron. Portland, meanwhile, has pursued another kind of design excellence: that of a great city, one that balances small blocks, greenspaces, historic preservation and transit while favoring pedestrians over the automobile. In Portland, architecture is praised for fitting into the urban fabric, not standing in contrast to it. Yet if you open any history of American architecture, two Portland buildings are always included, not just because they're by noteworthy designers but because they pioneered whole eras—and stood out proudly from the norm: Pietro Belluschi's Equitable Building (1946), credited as the first office building in the United States with a now-universal glass curtain wall, and Michael Graves' Portland Building (1982), which was the world's first major work of postmodern architecture. In its 32 years, the Portland Building has in many ways not aged well. Small windows mean city office workers, devoid of natural light, take more sick days than their colleagues in other buildings. The building was built cheaply, which today has prompted an estimated $95 million in repair costs, as well as the attendant soul-searching about whether a restoration is worth the money; after all, even at that price tag it would still be a miserable place to work inside. What's more, postmodernism never quite took off as the successor to modernism. While it's true that in the 1970s and '80s the style provided a needed antidote to concrete-heavy Brutalism and the corporate cliché of reflective-glass office towers, adding color and whimsy to city skylines, postmodernism was a victim of its own cartoonishness. Postmodern architecture stars like Graves, Philip Johnson, Peter Eisenman, and Robert Venturi adeptly embraced past historical architectural forms, but in an oversized way that felt like mockery as much as homage. Given the Portland Building's inherent structural problems and its comically dated-looking exterior (especially the fake ribbons), it would seem that if there were ever a time for a city to tear down its most historically significant work of landmark architecture, this would be it. Yet for a city that bills itself as unique among west-coast American metropolises, one that emblemizes the economic and social value of placemaking, Portland can't simply bring in the wrecking ball. 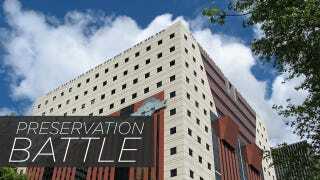 The Portland Building question isn't just one of saying yes or no to preservation. It's one that demands a kind of third way. Whether it's via a design competition or by re-hiring Graves, the city needs a hybrid solution for the Portland Building. Its structural decay and inherent interior design flaws give precedent for something we rarely see from a landmark building: a thoughtful union of old and new. Most all preservation projects seek to faithfully restore what was there and, if any new elements are created, match them as closely as possible to the original, or they go for demolition. Yet there are countless examples of hybrid architecture that's compelling precisely because of the juxtaposition of old and new. Think of Norman Foster's Great Court at the British Museum, for example, and how its glass canopy made the museum's central courtyard work better than it ever had before, becoming a visual signature for 21st century London along the way. Think of how SHoP Architects' imaginatively cantilevered a new, thoroughly modern, zinc-festooned addition off the back and sides of a 1905 Renaissance Revival building: like a tree sap rising out of a stump. In each case, the new architecture didn't just work in harmony with the old: it completed it. Imagine a future in which the oppressive Portland Building interior of fluorescent lights and low ceilings gives way to an atrium that fills the center of the space with natural illumination. Think of its base, a prison-like configuration of ground-floor retail set back behind a wall, becoming a glassy spot to gather over a signature Rose City cup of shade-grown organic chemex brew. In recent years Portland has enjoyed a newfound resonance on the cultural map, born from a DNA of defiant quirkiness. The TV show that celebrates Portland's armada of bearded hipsters, earnest aging hippies, and wired startup entrepreneurs is even called Portlandia, after the statue sitting atop one side of the Portland Building. Some calling for demolition have suggested the namesake statue could be moved to the banks of the Willamette River flowing past downtown, but it's not that simple. This isn't merely a question of whether or not to demolish a building, or even a famous one. It's a referendum on what kind of city Portland wants to be. Is it one that talks big about being progressive and innovative as it sidles up like a slacker for another soy latte, or one willing to be as different from the norm as Graves' design sought to be? It's common knowledge that the Michael Graves-designed Portland Building is one of the ugliest buildings in the world, presiding over the city's civic center like a cardboard box that took a wrong turn on the way to the military supply store. But it's not just ugly, it's uncommonly ugly. It's train wreck-ugly. It's so-bad-it's-good ugly. I dare you to divert your eyes from the beige cube. You can't! Not that I'm blaming Graves for the design—this is his style. Graves' buildings aren't as much buildings as they are urban follies. They're like showy brooches affixed on the black wool lapel of a monotonous cityscape. The Portland Building is meant to be enjoyed for its frivolousness, its salmon stripes and emerald bows sashaying in the blank reflections of grey glass towers. Its pops of color are a welcome sight on the skyline, especially in a city so often shrouded in clouds and angst. But a cute outfit does not make a great building. We've all heard the horrors of what it looks like inside—dark, windowless, mauve. (Actually, does anyone really know what it looks like inside? I could only find a few blurry photos. Do the municipal workers who have their offices inside sign an NDA?) It's not even a good neighbor. The covered arcades are not all at street level and are therefore useless to pedestrians. The main entrances turn their back on an adjacent park. So it's pretty obvious that as a piece of architecture it doesn't work. Pietro Belluschi, who designed Portland's other most famous building, might have said it best: "I think it's totally wrong. It's not architecture, it's packaging." It's really just a graphic wrapper. And it looks great in photos. Which takes us over to Portland Monthly, where Randy Gragg poses an excellent question: Does actually experiencing the building matter? Yes, we can all appreciate the Portland Building as an important part of many things—the city's architectural history, the mantra to Keep Portland Weird, even Graves's own postmodernist legacy. But you can do all that without actually ever stepping foot inside of it. You know how some buildings are street-ugly, but then you go inside and your whole life is suddenly transformed? For the Portland Building, it's better from a distance. The Portland Building is a package, a shell, a sugary layer of artificial-tasting fondant folded over a sheet cake. It's essentially a large work of graphic design. It does not matter what's inside. It exists in the world only as a facade, nothing more. So does the Portland Building need to exist as three-dimensional structure? No. Can proper appreciation and acknowledgement of this particular building occur through our own interpretations, and images? I say yes. And Portland, you can do it in a way that honors its legacy—and your future. The building photographs supremely well—those dimensions are practically made for Instagram—so have an en masse documentation session for the building: a chance for the whole city to celebrate the structure, snap some photos, and donate them to the city's archives via hashtag. Then, tap Portland's impressive creative community—designers, photographers, motion artists, filmmakers, illustrators—to capture and interpret the Portland Building one final time in the way they'd like to remember it. You now have the building celebrated and commemorated in hundreds, if not thousands, of different works of art, all unique, all better than actually stepping inside the building itself. You've now got images for public art installations, gallery shows, books, websites, and tote bags that will help the building live on forever. But it's true that the best part of the Portland Building is its scale. So on certain nights, you'll project those images on a surrounding building of equal size and shape (using technology like this, which projected images on L.A.'s City Hall for New Year's Eve). Now, you have the ability to turn any boring building in downtown Portland into the colorful, quirky Portland Building for a night or two. Follow it with a screening of a film shot in Portland—Mr. Holland's Opus?—or an episode of Portlandia, if you'd like. Then tear down the Portland Building and use the land to expand the adjacent park. People can sit there while they watch the show.